Located in the heart of downtown Phoenix, at Cityscape, the Blue Hound Kitchen & Cocktails labels itself as a neighborhood –friendly yet casually polished gastro-lounge which hosts amazing happy hours. To compete with the working professionals hour lunch break, Chef Sean Currid recently revamped their lunch menu to include more fresh, flavorful options that lean towards the healthy side, along with some tempting choices for those who don’t worry about their waistline. Forget the salads in plastic bowls and the sandwiches wrapped in paper, for just a couple of dollars more-less than $20 a plate, you can experience fine dining and put an end to the lunchtime monotony. 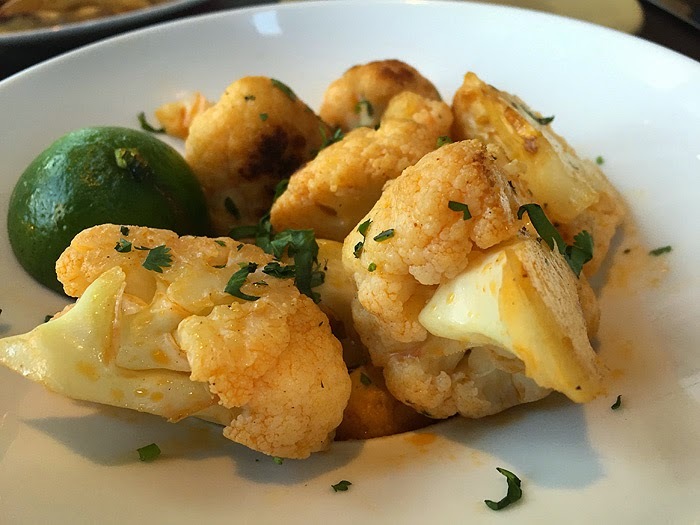 We began our lunch with the Roasted Cauliflower. This appetizer is roasted with chile, cilantro and lime. The chile oil is not too spicy, but an exciting and tasty way to enjoy some veggies at lunch. Next, we moved on to lunch entrees and decided it would be best to split a few because they all sounded so tasty. We sampled the Seared Ahi Salad, served on a bed of local greens with avocado, cucumbers, pickled chiles and cilantro. The tuna was seared perfectly and was complimented greatly by the avocado and peppery arugula and cilantro. Having worked downtown for years and sampled the majority of the salads it has to offer, I can say that this is my new favorite by far! 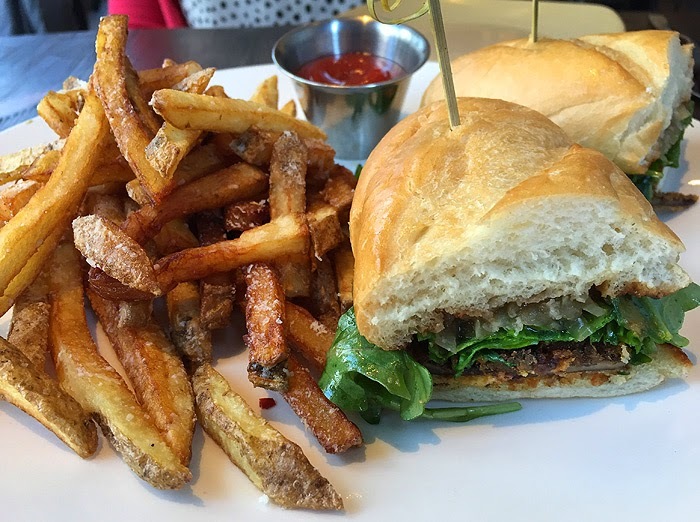 Next we tried the Chicken Fried Portobello Sandwich which is served on a fresh bread roll and topped with caramelized balsamic onions, a tomato jam and arugula. I have never had a crispy Portobello sandwich before and this was delicious. The Portobello is breaded and meaty so you feel satisfied and full, but a tasty way to enjoy a vegetarian meal. For those who delight in a cheesy hamburger, I witnessed the delivery of a literal mouthwatering cheeseburger from heaven get delivered to a nearby table. Two patties, served with a pimento cheese and bacon that is so thick and plentiful that it overlays the fresh pretzel bun it is served on – it was truly a beautiful burger. Our final treat at lunch was a delectable Pineapple Upside-Down Cake served with medjool date ice cream and a salted caramel sauce. 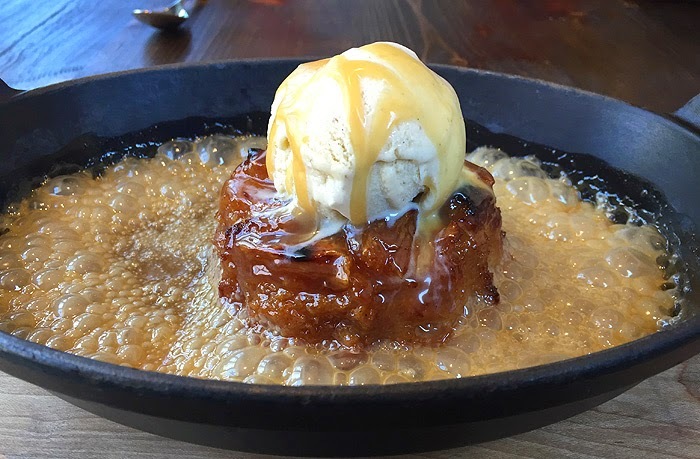 It arrives at your table on a hot skillet with the caramel sauce bubbling, a truly sweet and exquisite dessert. If you are in need of a lunch that will impress potential clients, celebrate a coworkers birthday or just to treat yourself, the Blue Hound is your place. Fresh, healthy, and with a comfortable patio I look forward to my next visit. 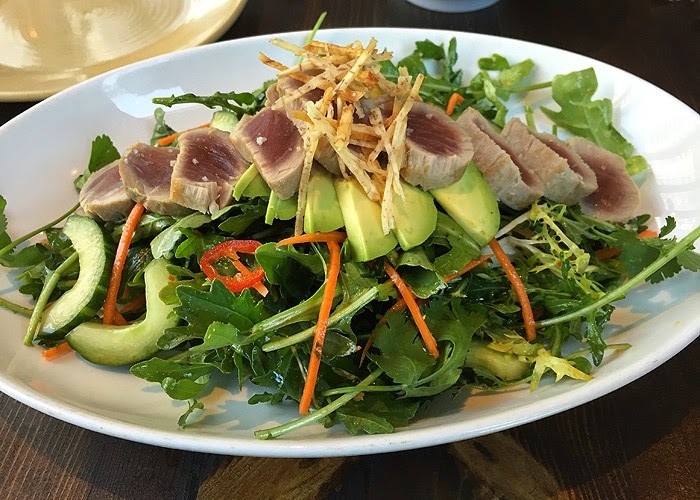 That ahi salad is calling out my name! Such a great idea for a salad. All of this food looks great. Whoa, that dessert looks CRAZY delicious!! Great photos, sounds and looks like quite the experience! I used to work near a restaurant in Providence, RI that served a similar Ahi Tuna Salad - and it was my favorite! I can totally see why it's your favorite too! The roasted cauliflower sounds like a great starter, but the pickled chilies in that ahi salad really peaked my interest. I love the roasted cauliflower and the salad!! Looks like a perfect spot to dine! Chicken Fried Portobello Sandwich! Sign me up! I NEED that seared tuna! That dessert presentation is so eye-catching and sounds so delish! Thanks for the recommendation!